Pulsating with an electrified glow, Eric Freeman’s paintings resonate disquiet energy, their minimal compositions dizzying in their defiance of space. Comprised of four diffused coloured bands set vertically against a black ground, Industrial Road reverberates with immaculate tension, its forms appearing to undulate in 3D perspective. 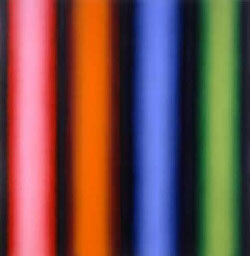 Drawing comparison to abstract painters such as Ellsworth Kelly and Frank Stella, as well as sculptors such as Dan Flavin and James Turrell, Freeman’s work combines the illusory qualities of paint with the physicality of altered environment; his large scale canvases having the effect of magnetic fields, shifting the perception of centre of gravity. 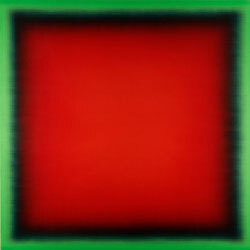 Paying homage to artists such as Joseph Albers and Marc Rothko, Eric Freeman’s Red Inside Green re-devises the metaphysical qualities of abstract painting for a contemporary age. Using contrasting hues, Red Inside Green offers subtle deception through colour perspective, its geometric forms continuously bulging and receding in illusionary space. 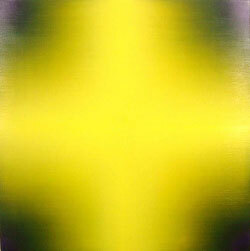 Seamlessly painted in oil, Freeman’s canvas possesses an artificial vivacity; its ethereal glow reminiscent of plasma screen technology, creating an electrifying aura that is both spiritual and synthetic. Bjorn Wetterling Gallery, Stockholm, Sweden.